On this Sunday after the Nativity of Christ, Fr. Andrew talks about Paul's personal sense of Christ in himself. Fr. 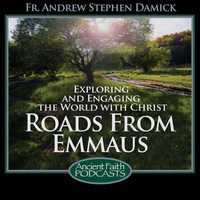 Andrew discusses the House of Stephanas which Paul baptized and how we should emulate them. On Christmas Eve, Fr. Andrew asks how we will live at Christmas. Discussing St. Paul's saying 'Christ is our peace' from Ephesians 2, Fr. Andrew talks about the true nature of the peace that was inaugurated by the birth of Jesus.